A pronoia was a type of conditional grant from the emperor, often to soldiers, of various properties and privileges. 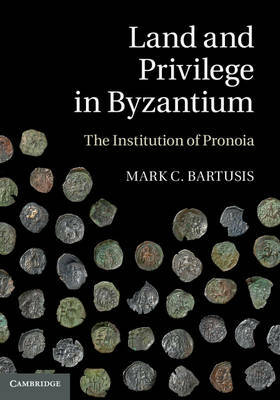 In large measure the institution of pronoia characterized social and economic relations in later Byzantium, and its study is the study of later Byzantium. Filling the need for a comprehensive study of the institution, this book examines the origin, evolution and characteristics of pronoia, focusing particularly on the later thirteenth and fourteenth centuries. But the book is much more than a study of a single institution. With a broad chronological scope extending from the mid-tenth to the mid-fifteenth century, it incorporates the latest understanding of Byzantine agrarian relations, taxation, administration and the economy, as it deals with relations between the emperor, monastic and lay landholders, including soldiers and peasants. Particular attention is paid to the relation between the pronoia and Western European, Slavic and Middle Eastern institutions, especially the Ottoman timar.